ABSTRACT: This paper investigates a fairly common but seldom-studied rhythmic notation in the nineteenth-century piano literature, in which duplets in one voice occur against triplets in another, and the second duplet shares its notehead with the third triplet—a logical impossibility, as the former note should theoretically fall halfway through the beat, the latter two-thirds of the way. Examples are given from the works of several composers, especially Brahms, who employed such notations throughout his career. Several alternative realizations are discussed and demonstrated in audio examples; the most appropriate performance strategy is seen to vary from one example to another. Impossibilities of type 1⁄2 = 2⁄3, as described above, are the most common, but many other types occur. Connections between such rhythmic impossibilities and the controversy surrounding assimilation of dotted rhythms and triplets are considered; the two phenomena are related, but typically arise in different repertoires. 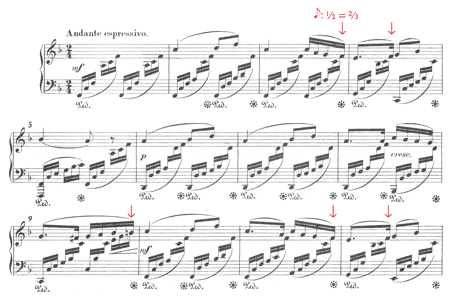 A few other types of impossible notations are shown, concluding with an example from Scriabin’s Prelude in C Major, op. 11, no. 1, in which triplets and quintuplets occur in complex superposition. The notation implies several features of alignment that cannot all be realized at once; recorded examples illustrate that a variety of realizations are viable in performance. [1.2] Example 1 is full of impossible rhythms. The trouble starts in measure 3, where two voices are notated on the lower staff. One voice, written with stems up, moves in sixteenth notes, duple subdivisions of the beat in the moderately slow 83 meter. The other voice, with stems down, moves in sixteenth-note triplets—triple subdivisions of the same beat. Two-against-three polyrhythms are commonplace in Brahms, and generally there is nothing impossible about them. But a predicament arises here because the two voices share many noteheads, as shown more abstractly in Example 2. No harm is done when the first duplet coincides with the first triplet, as those two notes should be struck at the same moment anyhow. There could perhaps be a question about how long this doubled initial note should be sustained, but that question is not my concern here, and at any rate it pales in comparison with the dilemma that rears its head upon the arrival of the third note. When the third triplet shares its notehead with the second duplet, as it does repeatedly throughout this variation, something is amiss, because these two notes should theoretically be articulated at two different times. The numbers in Example 2 indicate points on a time axis (not durations); time is measured in eighth notes from the most recent downbeat, in both voices independently. The second duplet should theoretically fall on the half-beat, while the third triplet should not be struck until two-thirds of the way through the beat—so Brahms’s notation implies that a single articulation somehow occurs at two different temporal positions, as represented by the mathematical impossibility 1⁄2 = 2⁄3. [1.3] Several proposed interpretations of this rhythm are given in Example 3. The only way to achieve mathematically accurate subdivisions in both voices is shown in 3a: the troublesome note must simply be played twice. 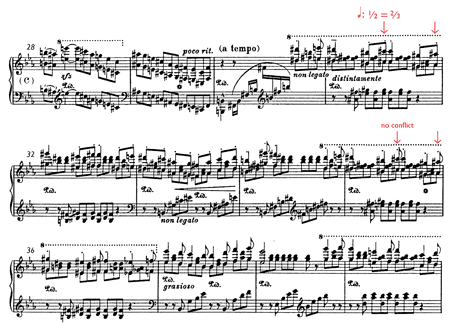 The added keystroke is pianistically ungraceful at best, and the audio example should be sufficient to convince the reader that 3a is not what Brahms intended, and not a realistic option in performance. The example is nevertheless instructive as a sort of unrealizable ideal, a paradigm of the two-against-three polyrhythm implied by the notation. If the final notes of the duplet and triplet groups did not coincide—if, say, the third triplet were B instead of E—then a strict polyrhythmic performance analogous to Example 3a would be unproblematic; it would, in fact, be the only rhythmically “correct” way to play the passage. It is only the shared note that makes this performance infeasible and forces the pianist to seek other options. [1.4] Example 3b and its slight variant 3b′ depict a performance with triplet priority: the triplets are played strictly in time and the duplets are “swung” in a 2-to-1 proportion to conform to the triplets. The remaining options give priority to the duplets, forcing the third triplet to arrive early, on the half-beat. At 3c the middle triplet is positioned midway between the first and third, so it too arrives early. At 3d the middle triplet is restored to its proper triplet position, creating an incomplete triplet in counterpoint with the duplet. Example 3d thus resembles 3a, but lacks the rearticulation of the duplicated note. Aurally, the incomplete triplet in 3d may be difficult to perceive as a triplet; this attack rhythm is perhaps more likely to be perceived as shown in 3d′, where a 32nd-note triplet subdivision within the first duplet implies a sixfold subdivision of the beat. [1.5] Brahms’s use of a self-contradictory notation for this rhythm is enigmatic in several ways. Brahms customarily took great care with his notation, and lavished considerable detail on this score in particular: notice, in Example 1, the copious explicit performance instructions written just in the opening measures of this variation. All of the alternative notations in Example 3 are clear and consistent, and all these notations were readily available to Brahms. In fact, Examples 4–7 show notations similar to 3a–d as employed by Brahms in other works—or even, in one case, elsewhere in this same work. [1.6] Although Example 3a was dismissed as pianistically infeasible, such a pattern becomes a reasonable option when the two voices are performed by two different musicians. In Example 4 the eighth notes play the role of the sixteenths in the previous examples. Several times in this example the third note of a piano triplet shadows the same note sounding a fraction of a beat earlier in the second of a pair of duplets in the voice, a heterophonic effect similar to Example 3a. [1.7] Example 5, from the final variation in the same set as Example 1, features triple subdivisions only, including an explicit indication of triplets against “swung duplets,” notated just as in 3b. [1.8] In Example 6, the piano part closely resembles a textural inversion of Example 1, but there are no triplets: the rhythmic notation in the right hand is written unambiguously in a way much like Example 3c, privileging the duplets. [1.9] Finally, the piano part in Example 7 features a recurring pattern that includes duplets against incomplete triplets, rather like 3d. [1.10] It is reasonable to suppose that Brahms’s preferred way of performing Example 1 must have resembled Example 3b (and therefore Example 5), Example 3c (and 6), or Example 3d (and 7)—but in that case it is also reasonable to wonder why he chose the notation of Example 1 rather than the unambiguous alternative. Above all, it is reasonable to ask what a pianist should do when playing this variation. On the evidence of op. 21, no. 1’s modest discographic record, the path of least resistance seems to be that of Example 3b: take the fastest notes—the triplets—at face value, letting the duplets fall where they may. As justification for this reading, one might say that the duplet notation is to be read not as a strict metrical prescription, but only as an indication of grouping or voice leading involving a subset of the triplets. Furthermore, because the right hand plays only duplets, it could be argued that the left hand must project the triplets accurately in order for the basic two-against-three conflict to be heard. Some might suggest also that instead of reading too much into Brahms’s choice of note values we should be reading the visual alignment of the score: in Example 1 the second duplet in each right-hand pair, rather than aligning with the second duplet (third triplet) in the left hand, typically falls instead between the second and third triplets, consistent with a triplet-priority performance of the left-hand rhythm. Indeed, of the alternatives in Example 3, it is 3b that most closely approximates the way this rhythm is played in every recorded performance of which I am aware. Wilhelm Backhaus’s 1935 performance, sans repeats, is offered as an example (listen to Audio Example 1a). [1.12] Perhaps the strongest argument for a duplet-priority performance is that the duplets carry more integrity as an independent voice than the triplets. Structurally, the two voices in the left hand are not the lines indicated by the stems and beams at all: rather, the duplets form one voice, and the other is the bass line, consisting of the middle triplets only, as accompaniment to the canon. (Reading the duplets and triplets as independent voices results in a great number of dubious parallel unisons.) Backhaus’s performance, like most others, accentuates the right-hand melody over a continuous carpet of relatively undifferentiated triplets. In practice, the more one wishes to bring out the imitating voice in the canon (the upper voice in the left hand), the more one would like to hear that voice moving in a rhythm of equal duplets. [1.13] The performance in Audio Example 1b takes advantage of the variation’s two-reprise structure to present two alternative interpretations of the contentious left-hand rhythm. The first time through each half of the variation, the performance resembles Backhaus’s (and Example 3b), bringing out the right hand and giving metric priority to the triplets in the left. The repeats, in contrast, give prominence to the imitating voice in the canon, now played in duplets. In the repeats the placement of the middle triplets approximately as in Example 3d highlights the independence of this third voice and forces the bass notes to be short, perhaps conjuring the image of a pizzicato cello accompanying the canon. [2.2] The impossibilities in Examples 9–13 are all of the same general 1⁄2 = 2⁄3 type as Example 1, but each has its own idiosyncrasies, sometimes suggesting something about the composers’ intentions or preferred performance strategies. In Example 9, a straightforward three-against-two polyrhythm has been in effect for eight measures before the notational impossibility arises with the emergence of an evanescent inner voice in duplets, stemmed alternately to the lower and upper staves. Maintaining the established pattern requires the performer to conform the new duplets to the rhythm of the triplets—that is, to play the passage with triplet priority. [2.6] In any case, a small fractional difference between two theoretically distinct attack points may in some circumstances be subsumed by rhythmic flexibility on the part of the performer. The difference between 1⁄2 and 2⁄3 is only one-sixth of a beat, a time span easily dwarfed by the variations in expressive timing common in performances of the nineteenth-century repertoire. As an illustration, consider the single impossible notation in measure 24 of Example 12, which occurs at the cadence marking the end of the first section of a ternary-form composition, where an expressive ritard is appropriate. In the accompanying audio example, the listener who attends to the triplets may hear the C as a triplet, arriving nearly in tempo, but by attending instead to the eighth-note duplets, one may hear the same note as a duplet with a modest ritard. The listener may therefore experience at least the illusion of the ideal two-against-three polyrhythm, an illusion that is perhaps exactly the intent of Brahms’s notation. Considerations of expressive timing are surely relevant in many examples of impossible rhythms, but particularly in cases such as this, in which the notation in question falls precisely at a place where a phrase-final lengthening is expected. [2.7] In Example 13 we see a composer apparently changing his notational mind. In measures 31–33 Liszt writes a series of 1⁄2 = 2⁄3 impossibilities. Four measures later, a parallel consequent phrase begins with identical music, but the duplets are now abandoned in favor of an unambiguous triplet-priority notation. Triplet priority may be the only reasonable option in performance all along, and it is tempting to regard the duplet notation in the first phrase as an oversight, though this notation perhaps suggests to the performer something about the way the phrase may be shaped or the melody accented. [2.9] A desire for notational clarity may bear upon impossible rhythms in various ways. 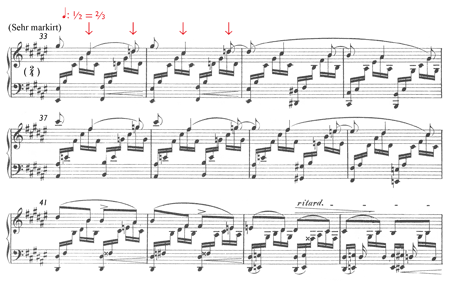 Examples 15 and 16 illustrate a common Schumann trait: a melody that hovers around the beat without quite being on it. The top-voice melody in Example 15 is written in ordinary quarter and eighth notes, but many of these notes must arrive a bit late in order to accommodate the waves of accompanying sextuplets; numerous 1⁄2 = 2⁄3 impossibilities occur as a result. A similar sort of melodic displacement arises in Example 16, where again many melody notes seem to fall a sixth of a beat late. 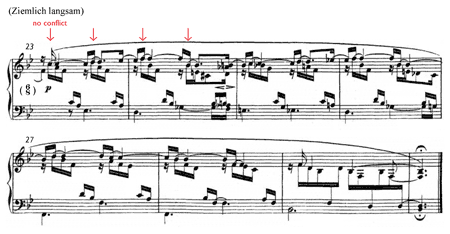 Here, however, Schumann notates the rhythm of the melody without contradiction, the more exact notation perhaps necessitated by the slower tempo, which makes the sixth-beat discrepancies more apparent. 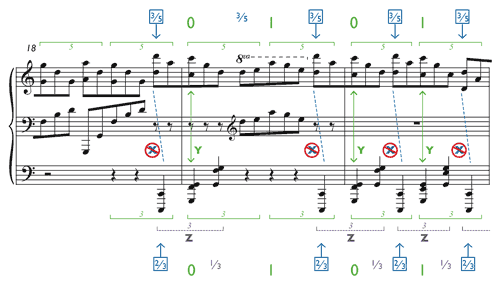 The notation of the melody in Example 15 looks simpler than that in Example 16, suggesting that some impossible rhythms may be notated as they are only because the impossible notation is visually simpler than a theoretically correct notation would be. [2.11] A higher degree of complexity appears in measure 3 of Example 18, where a triplet melody must share its notes with a pattern of 32nd notes. As detailed in Example 19a, Schumann’s notation implies the impossible equations 1⁄3 = 3⁄8 and 2⁄3 = 5⁄8. If the 32nds are played strictly in time, the notated triplets will divide the beat in a 3:2:3 proportion, as shown in Example 19b. These unequal triplets are clearly audible in the recording by the Portuguese pianist Maria João Pires (listen to Audio Example 2a). 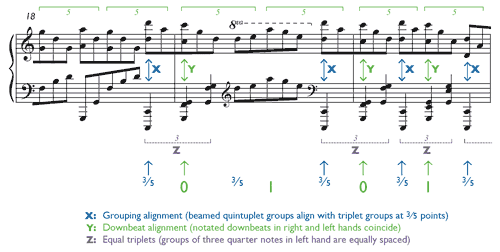 Each middle triplet is appreciably shorter than its siblings (even at measure 19, where the triplets gain prominence from the left-hand doubling), and this unevenness likely contributes to the breathless quality of the music in this performance. [2.12] Sviatoslav Richter, in a concert performance of the same work, somehow makes the triplets more equal. The first triplet in measure 3 is somewhat distorted, but the remaining triplets proceed at a very uniform pace. The rhythm of Richter’s 32nd notes is difficult to hear precisely, but must be something approximating Example 19c. At measure 19, Richter brings out the lower doubling of the triplets considerably more than Pires does; we might suppose that the evenness of Richter’s triplets makes this voicing more acceptable (listen to Audio Example 2b). [3.1] In addition to the triplet conflicts discussed above, Example 18 includes another notational curiosity at measures 14 and 16: a dotted rhythm in which the dotted eighth note seems to occupy only five-eighths of a beat, suggesting the impossible equation 3⁄4 = 5⁄8. 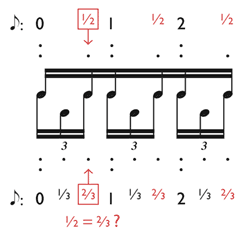 This example opens up a new category of ostensibly impossible rhythms in which dotted rhythms are forced into something other than the usual 3:1 proportion. Of course, if one acknowledges that dots may be somewhat variable in length—a proposition commonly advanced, at least in the context of certain repertoires—then such rhythms need not be considered impossible at all. Examples 20–22 offer some additional nineteenth-century illustrations of this phenomenon. [3.6] The nineteenth-century examples of impossible rhythms presented in the earlier sections of this article are not unrelated to the triplet-assimilation problem, but in some ways they present a fundamentally different and more peculiar sort of quandary, one not addressed by a single decision about the length of a dot. Noteheads shared between two voices played by a single musician are an essential feature of these examples, essentially limiting their scope to music for the keyboard, and indeed, the repertoires in which the two problems arise are nearly complementary. The assimilation problem is generally supposed by those on all sides of the controversy essentially to end with Schubert, excepting only an occasional slightly later example such as the Chopin Prelude. Brown gives several examples intended to show that later composers such as Mendelssohn, Schumann, Berlioz, and Brahms differentiated their note values more scrupulously (Brown 1999, 616–21). Impossible rhythms of the shared-notehead variety, on the other hand, really pick up steam only after the time of Schubert. As the examples above suggest, I have found more such notations in the music of Brahms than in any other composer, spanning his career from the Sonata, op. 1, to the very last page of the Vier ernste Gesänge, op. 121. Some of the characteristics for which Brahms is celebrated seem ideally suited to the formation of impossible rhythms: he was fond of polyrhythms and contrapuntal textures, and often wrote multiple voices on one staff. Brahms’s scores might be described as being denser in information content than those of many other composers of his time, and an impossible rhythm is essentially a case of too much information—so much, in fact, that some of it becomes contradictory. Notational complexity is hardly surprising in an era when rhythmic notation bears greater burdens than ever before, but it is remarkable in this climate of notational “precision” that this complexity so often produces instructions whose precise observance is theoretically unattainable. [4.1] Admitting vertical alignment as a potential source of impossibility in rhythmic notation broadens the scope of our inquiry considerably, not only by eliminating the restriction to keyboard music but also by allowing for superposed rhythms of increased complexity. 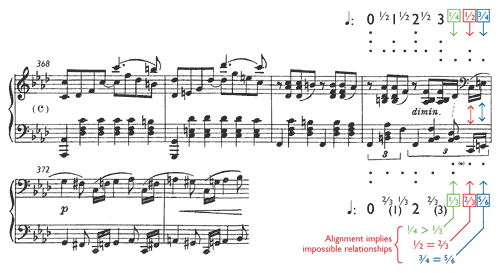 Example 27, although it involves only the piano part of Franck’s Quintet, suggests that even a composer may at times be misled by a deceptive alignment. [4.3] A curious passage in the First Tableau of the original 1911 version of Stravinsky’s Petrushka is shown in Example 28. (17) The score presented here is considerably condensed, but its rhythmic complexities capture those in the full score. At measure 25, a melody enters in 87 in the piccolo and oboes, actually an irregular diminution of the concurrent line in the low strings and bassoons. One bar of the woodwinds’ 87 equals one bar of the prevailing 43. When the measure lengths begin changing five bars later, the instruction = seems an odd choice, inasmuch as the half note does not define a primary pulse in either the 43 or the 87 meter. Clearly, though, the undulating eighth- and sixteenth-note accompaniment figures should continue at the established pace at the change to 42, so the given indication may be considered equivalent to = or = . [4.4] The same instruction appears also on the piccolo-oboe melody, where it proves thornier. The meter change here is from 87 to 85, one 85 bar in the winds occupying the time of a 42 bar in the rest of the orchestra. The problem is that eighth notes at five-in-the-time-of-four are of necessity slightly faster than the previous seven-in-the-time-of-six. If the note values are to stay the same in the 43 parts, therefore, the note values in the piccolo and oboes cannot stay the same as instructed, but must speed up slightly. A further quickening, to eight-in-the-time-of-six, is implied in the 88 bar two measures later (where the woodwind melody is joined for the first time by a trumpet). The changes to this point might be absorbed into the general poco a poco accelerando marked at measure 30, but the subsequent reversion to 87 implies that the woodwind eighth notes get slower again before cycling irregularly through all three configurations in the following measures. Although the 7:6 and 5:4 polyrhythms are unlikely to be heard clearly at this tempo, the required variation in the length of the woodwinds’ eighth notes is significant enough that the players must be aware of it—even if it cannot be deduced from the music in front of them. To the listener, this fluctuation is especially evident in measures 32 and 33, because the eight melody notes in the former measure occupy the same span of time as seven in the latter (a constant 43 measure in the rest of the orchestra: only the piccolo, oboe, and trumpet parts show a meter change at measure 33). [4.5] When Stravinsky revised Petrushka in the 1940s, he reconsidered this notation as shown in Example 29. There are many small changes in details of orchestration and articulation, and the general accelerando has been eliminated (perhaps a change of little consequence: acceleration is barely discernible, if at all, in most performances of the original version, and it leads in any case to a new section at measure 42 at essentially the same tempo as before). More significantly, the impossible aspects of the notation have also been removed, for the time signatures 43 and 42 now appear in all parts. The woodwind melody is written not in eighth notes in 87, 85, and 88, but rather in 7-, 5-, and 8-tuplets, each spanning an entire measure of 43 or 42. [4.6] The revised notation is surely more precise, and makes the changing note lengths in the woodwinds explicit. On the other hand, it is plausible that Stravinsky wanted the woodwinds’ eighth notes, floating above the pulsations in the rest of the ensemble, to sound more or less steady throughout the passage—an intent implicit in the original notation but relinquished in the revision. Two recorded performances, both of the 1911 version, are revealing. Pierre Boulez (Audio Example 3a) meticulously controls the subdivisions in the woodwind melody as detailed above and as codified in the more punctilious 1947 notation. The varying speeds of eighth notes are clearly audible, especially in the 88 measures. Stravinsky’s own 1960 performance (Audio Example 3b) is generally much less precise than Boulez’s, and the alignment of downbeats is sometimes hazy. Attending just to the woodwind melody, however, a listener is less aware of changing note lengths in Stravinsky’s performance than in Boulez’s. [5.1] An especially perplexing dilemma is posed by Scriabin’s Prelude, op. 11, no. 1, shown in Example 30. The eighth notes running throughout the piece in the right hand are actually quintuplets, five in the time of four, ten notes in every 22 measure. (18) Scriabin beams the notes in groups of five, but the beamed groups are displaced across the barlines, the first two notes of each group falling before the beat. Example 31 explicitly shows the two-note offset between Scriabin’s beamed groups and the “metric quintuplets” that start on the half-note beats: each beamed group begins three-fifths of the way to the next beat. The beats and the 3⁄5 points also support the most salient melody notes in the right hand throughout much of the piece, such as the D–C motive highlighted by tenuto marks in the opening measures. [5.2] The left hand often plays the same quintuplet rhythm as the right, but quarter notes appear in the left hand as well: briefly in measure 8, and almost continuously from measure 19 to the end. Three quarter notes occupy the time of five quintuplets, so the quarter notes must be triplets, three in the time of two, though Scriabin’s notation does not make this explicit. Like the quintuplets, the triplet groups are displaced from the beats, the first triplet in each group falling before the beat. Condition X: The two kinds of groupings apparently begin simultaneously, as the first triplet in each group aligns with the first quintuplet. Consequently the first triplet in each group must fall at the 3⁄5 point. Condition Y: Whenever a triplet crosses a barline, the notation shows that the second triplet in the group falls on the downbeat, coinciding with the third quintuplet in the concurrent right-hand group. Similarly, in the mid-measure triplets in measures 20, 22, 23, and 24, the second triplet in the group appears to align with the quintuplet on the second beat of the measure (the beat labeled “1” in Example 32). Condition Z: The three triplets in each group are evidently equal in duration. The quarter notes all look the same; there is nothing to indicate that any of them should be longer or shorter than the others. [5.4] The problem, of course, is that X, Y, and Z cannot all be true. If X and Y are true, then the first triplet takes up the time of two quintuplets—two-fifths of a beat rather than one-third—so the three triplets cannot be equal. [5.5] Although satisfying the three conditions simultaneously is impossible, it is possible to satisfy any combination of two of them. Examples 33–35 show the three possible pairings, beginning with the combination “X and Y but not Z” in Example 33. Here the groupings align at the 3⁄5 point (X), and the second triplet aligns with the third quintuplet at the downbeat (Y), but the triplets are unequal (not Z). As notated in the example, each triplet is played in the proportion 4:3:3. [5.6] Example 34 is a rather clumsy attempt to show “X and Z but not Y.” Here again the groupings begin together at the 3⁄5 point (X), but now the triplet divides the time until the next 3⁄5 point into three equal parts (Z). As a consequence, each middle triplet falls one-fifteenth of a beat early relative to the beat where condition Y would place it. My notation in this example is awkward, to say the least. Conventional notation does not offer a simple way to notate an equal division of a time span that begins partway through one measure and ends partway through the next. To notate this properly would require showing a fifteen-fold subdivision of the beat, giving the score an oddly Carteresque appearance; I hope that the notation in Example 34, ungainly as it is, may get the point across. [5.8] What is a performer to do in the face of these conflicting indications? Which two conditions should be respected, and which one violated? Recorded evidence in this case shows significant differences of opinion. Audio Example 4a below is a performance by Ruth Laredo that fairly closely matches Example 33. When the triplets enter in measure 19, one can hear that the groupings align and the downbeats align, but the triplets are noticeably unequal in duration. [5.9] The difficulty of notating Example 34 precisely may be taken in a roundabout way as evidence in support of this reading: perhaps, unable to write exactly what he wanted, Scriabin had to settle for a simpler approximation. 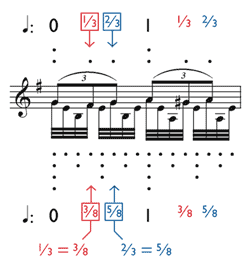 The performance by Mikhail Pletnev (Audio Example 4b) resembles Example 34 more closely than Example 33: Pletnev’s triplets are appreciably more uniform than Laredo’s, and at least most of the time the middle triplet falls distinctly before the beat defined by the right hand’s quintuplets. [5.10] Most available recordings of this Prelude conform broadly to one or the other of the above two approaches, respecting condition X and violating either Y or Z. The alternative in Example 35, “Y and Z but not X,” seems to have been rejected by most performers, or not to have entered their minds. This combination, however, has much to recommend it, starting with the evident deficiencies in the two readings just considered: the odd proportions of the quarter notes in Example 33 and the non-alignment of the second triplet with the beat in Example 34. The half-note beats are projected with some clarity in the right hand, reinforced by details such as the tenuto marks near the beginning of the piece and octave doublings near the end. In measure 20 and again in measure 22, a prominent 4–3 inner-voice resolution in the left hand seems to warrant a position of metric strength; this inner-voice motion has been heard since measure 2, where the same F and E, embedded in the left-hand quintuplets, fell clearly on the beats. The low C in the final measure of the piece will be heard as a downbeat no matter what, but this is simply the next quarter note in line, so if it falls on a beat, presumably other notes in corresponding locations should be similarly positioned. Finally, the misalignment of the triplet and quintuplet groups (“not X”) in Example 35 is defensible: the slight delay between the right- and left-hand attacks represents the most common kind of asynchrony in piano performance (called a “melody lead” in Palmer 1996), and allows the player a little more time to negotiate the large leaps in the left hand at the end of measures 18, 19, and 21 without disrupting the flow of quintuplets in the right. [5.11] One recorded performance at least vaguely resembling Example 35, remarkably, is a performance by the composer himself, recorded on a piano roll in Moscow in 1910 (Audio Example 5a). There is more tempo variation in Scriabin’s performance than in any modern recording; the difference in tempo from the beginning of the piece to the end may come as a shock to twenty-first-century ears. 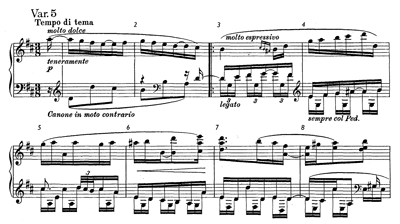 Scriabin’s technique is hardly a model of clarity, and exact note placements are difficult to judge, but at least a few times one can hear the right-hand quintuplet groups starting before the left-hand triplet groups (“not X”), as in Example 35. 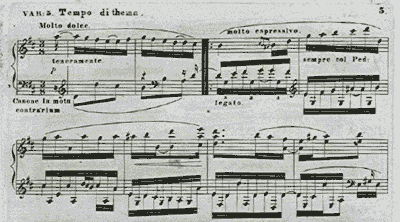 [5.12] As a vindication of my preference for Example 35, Scriabin’s performance is admittedly nebulous. My own effort is provided as Audio Example 5b. [6.1] What to make of impossible rhythms? Do they represent mere carelessness on the part of the composer? A bad edition? An attempt to simplify a notation that would otherwise be inordinately complex? A deliberate attempt at provocation, by stretching the limits of conventional musical notation? An approximate representation of an imaginary ideal, a desired auditory illusion, rather than a precise timing instruction? A hint to nuances of expressive timing that the composer expects of the performer? An indication not of temporal matters at all but of grouping or voice leading? Does this study amount to little more than a finicky obsession with distinctions so minute as to be insignificant—or at least to be camouflaged in the mists of the rubato playing appropriate to most of the examples considered here? [6.2] One or a few of the above examples might be adduced in support of each of these hypotheses, but I have come to believe that no single explanation adequately accommodates all the examples. An impossible rhythm was described earlier as a case of too much information. From the performer’s point of view, paradoxically, too much information is very like too little information: it means that one has to make a choice. Or, perhaps better, one gets to make a choice. At the outset I adopted the stance of a mathematician, but it is as a performer faced with making practical decisions about every detail of a score that I find myself most tantalized by impossible rhythms. Performers are accustomed to making choices about many things, but the basic meaning of rhythmic notation is not usually among them. This exceptional freedom of interpretive choice is one of the things that I find appealing about these rhythms, and ultimately it may be the best answer to the question of what they mean. Badura-Skoda, Paul. 1992. “Triolenangleichung bei Schubert: ein noch ungelöstes Problem.” Üben und Musizieren 4: 8–14. Bilson, Malcolm. 1994. “Triplet Assimilation in the Music of Schubert—A Reply.” Historical Performance 7: 27–31. Brown, Clive. 1999. Classical and Romantic Performing Practice, 1750–1900. Oxford: Oxford University Press. Byrd, Donald A. 1984. “Music Notation by Computer.” PhD diss., Indiana University. Clarke, Eric F. 1987. “Categorical Rhythmic Perception: An Ecological Perspective.” In Action and Perception in Rhythm and Music, edited by Alf Gabrielsson, 19–33. Stockholm: Royal Swedish Academy of Music. Friberg, Anders, and Johan Sundberg. 1995. “Time Discrimination in a Monotonic, Isochronous Sequence.” Journal of the Acoustical Society of America 98: 2524–31. Montgomery, David. 1993. “Triplet Assimilation in the Music of Schubert: Challenging the Ideal.” Historical Performance 6: 79–97. Neumann, Frederick. 1987. “Conflicting Binary and Ternary Rhythms: From the Theory of Mensural Notation to the Music of J. S. Bach.” Music Forum 6: 93–127. Palmer, Caroline. 1996. “Anatomy of a Performance: Sources of Musical Expression.” Music Perception 13: 433–53. Rosenblum, Sandra P. 1988. Performance Practices in Classic Piano Music: Their Principles and Applications. Bloomington: Indiana University Press. Yorgason, Brent. 2009. “Expressive Asynchrony and Meter: A Study of Dispersal, Downbeat Space, and Metric Drift.” PhD diss., Indiana University. Backhaus, Wilhelm. 1935. Concerto for Piano and Orchestra No. 2 in B flat major, Op. 83. Johannes Brahms. Allegro CDO 3034. Boulez, Pierre (conductor). 1991. Stravinsky: Petrouchka / Le Sacre du printemps. The Cleveland Orchestra. Deutsche Grammophon 435 769-2. Laredo, Ruth. 1971. Scriabin: 24 Preludes, Op. 11. Phoenix PHCD 114. Pires, Maria João. 2002. Artist Portrait. Warner Classics 0927-49141-2. Pletnev, Mikhail. 1997. Scriabin: Sonata No. 4, Op. 30. Virgin 7243 5 45247 2 1. Richter, Sviatoslav. 1968. Schumann: Bunte Blätter, Op. 99. BBC Legends 4103-2. Scriabin, Alexander. 1910. The Composer as Pianist. Pierian 0018. Stravinsky, Igor (conductor). 1960. Works of Igor Stravinsky. Disc 2. Columbia Symphony Orchestra. Sony 88697103112-02. 1. Earlier versions of this paper were presented at the Indiana University Graduate Theory Association Symposium (2008), the Society for Music Theory conference (Nashville, 2008), and colloquia at the University of Washington, the University of Iowa, and Florida State University. I am grateful for the many insightful comments received on those occasions, which have testified time and again to the extraordinary variety of perspectives and interpretations that sensitive musicians and listeners bring to the rhythmic phenomena discussed in this paper. Thanks also to Justin London for a thorough reading and several valuable suggestions, and to Ira Braus and Donald Byrd for some especially thought-provoking correspondence. 2. No autograph of op. 21, no. 1 survives. Eusebius Mandyczewski, editor of the Breitkopf edition (1927), cites the Simrock edition as his primary source. A few other differences between the two editions are worth mentioning, though they bear less significantly, if at all, on the analysis here. In the Simrock, the left-hand triplets are beamed in groups of nine, spanning an entire measure, rather than in groups of three as in Breitkopf. (Nine-measure phrases with nine notes to the bar, as in the triplet voice in this variation, are an extraordinarily rare circumstance.) In some measures Simrock reverses the stem directions in the left hand, stemming the triplets upward and the duplets downward. In measure 5, Simrock gives the 32nd-note subtriplet to the triplet voice while in Breitkopf it belongs to the duplet voice. (This subtriplet imitates the grace notes of measure 3, though not in inversion.) After measure 11 Simrock abandons the left hand’s duplet beams entirely, but even after that point the third triplets nearly align with the right hand’s duplets. Finally, the Breitkopf score shows an incorrect placement of the first ending in the variation’s final system; this has been corrected in Example 1 to match Simrock. 3. The present study is inevitably incomplete. In addition to rhythm/meter and performance practice there are many other angles from which the problem of impossible rhythms might be approached. Cognitive considerations are given short shrift here, as are historical precedents for the phenomenon. In some cases, a study of autographs and sketches might prove helpful in disentangling the roles of the composer and engraver. The direction (in several places in this movement) that the half-beat semiquaver in the melody should coincide with the third note of the triplet in the accompaniment is Mendelssohn’s own. This departure from the exact mathematical division of the beat is so conducive to smoothness that the Editor has ventured to adopt the same plan wherever the Right hand has to play at the same time notes both of the melody and of the accompaniment. The second sentence refers to spots such as measure 8, where in Macpherson’s edition the first and last sixteenth notes in the melody are both shifted slightly rightward to align with the final notes of the concurrent triplet groups (played here also by the right hand). Because no such realignment is shown when the duplets and triplets are played by separate hands, the “smoothness” that the editor so admires is apparently a function not only of timing but of ease of performance. I thank David Lewis of the Department of Computing at Goldsmiths, University of London, for bringing this edition to my attention. 5. The passage in Example 11 is discussed by Krebs, who describes the “superposition of the cello’s duplet eighth notes on the piano’s triplets,” implying a triplet-priority reading on the part of the pianist but without noting that the duplet notation is also present in the piano (Krebs 1999, 210). 6. Clarke 1987 shows that perception of rhythmic patterns is categorical: an ambiguous two-note pattern is typically heard either as a duplet or as a triplet, not as a member of some indeterminate middle category. Moreover, the boundary between the two categories shifts according to the musical context, perception of triplets becoming more likely in the presence of other triplets in the music. In the absence of other cues, Western-enculturated listeners are known to show a preference for binary metric groupings (Huron 2006, 195–96), so that a note placement that is mathematically closer to a triplet may nevertheless be perceived as a duplet. 7. Paired impossibilities like those of Example 14 appear also in “Die Mainacht,” op. 43, no. 2; “An die Tauben,” op. 63, no. 4; “Wenn ich mit Menschen- und mit Engelzungen redete,” op. 121, no. 4; and the finale of the Cello Sonata in E Minor, op. 38. The duplet beams in Example 14 are absent from the first edition of this song (Simrock, 1873), but the impossible notations appear in the first editions of all of the other works just mentioned. 8. Detailed performance studies show that pianists’ hands are rarely perfectly synchronized, nor is such synchronization necessarily considered desirable, even when (as is usually the case) the score contains no suggestion of asynchrony. See, for example, Palmer 1996, 441–42. 9. Estimating the “just noticeable difference” (jnd) in the time domain—the smallest variation in timing that listeners are able to perceive—is a complex subject. London reports the results of studies showing that “the lower limit for meter, that is, the shortest interval that we can hear or perform as an element of a rhythmic figure, is about 100 milliseconds” (0.1 seconds)—approximately the length of the 32nd notes in Example 18—but that separate tones can be discerned, and variation in interonset intervals between two sounds can be discriminated, with much finer precision, heavily dependent on musical context London 2004, 27). Friberg and Sundberg 1995 show that in the context of a steady stream of pulses, the jnd is about 2.5 percent of the interonset interval between pulses, down to a minimum jnd of about 6 milliseconds (0.006 seconds). A listener hearing one performance at a time cannot directly judge an offset between attack points in two separate performances of an excerpt such as Example 18, but the variation in the lengths of triplets performed in a 3:2:3 ratio as in Example 19b, even at the rapid tempo of this example, is significant enough to be perceived with little difficulty. 10. Ira Braus, in personal communication, has expressed a preference for still another performance strategy in measure 19: he suggests playing the right hand in even 32nd notes and the left in even triplets, so that the melodic doubling is not precisely synchronized. 11. There are, to be sure, some circumstances in which by the composer’s design a beat is not a microscopic pinpoint at all, but is dispersed over a period of time. These situations, which include rolled chords, some grace notes, and unsynchronized attacks such as those in Example 17 above, have been studied in detail by Brent Yorgason (Yorgason 2009), but are generally distinct from the examples considered in this article. 12. Example 22 is discussed in Byrd 1984, 57–58. Byrd’s dissertation, one of the few sources to mention explicitly the impossible nature of some rhythmic notations, confronts the problem for its implications on the design of music-notation software, which tends to resist attempts by users to do impossible things. 13. The Stichvorlage autograph of the Preludes is in the National Library in Warsaw. The E-major Prelude autograph is reproduced in full in the front matter to the 1949 Paderewski edition of the Preludes. 14. See Montgomery 1993 for an extensive bibliography on the subject of triplet assimilation, and Neumann 1987 in particular for examples in Bach and implications for earlier music. 15. Montgomery 1993 was written in direct response to Badura-Skoda 1992, and prompted a counter-response from Malcolm Bilson (Bilson 1994). The Winterreise excerpts in Examples 24 and 26 appear in Brown 1999, 617, and Montgomery 1993, 90, respectively, and other examples similar to these are discussed in both sources. 16. Errors of alignment are not uncommon in published scores, even when the note values are not in question. Undoubtedly many such errors are introduced during the engraving process. They may cause a performer momentary distraction even when the rhythms are simple, and can be seriously confusing in more complex situations. Several examples of the latter occur in the Schirmer editions of the piano works of Samuel Barber, for instance in the third of the Four Excursions, op. 20, measures 17 and 55, and the first movement of the Sonata, op. 26, measure 16. 17. I am grateful to Michael Cuthbert for calling the Petrushka example to my attention. 18. Chopin’s C-major Prelude, op. 28, no. 1, features five-note groupings also; this similarity is one of many ways in which the twenty-four Preludes of Scriabin’s op. 11 pay homage to Chopin’s op. 28. 19. Astute readers may note a fourth premise lurking in this discussion, namely the supposition that the five quintuplets in each group are equal. An alternative reading to those considered here is theoretically possible, in which conditions X, Y, and Z are all satisfied but the quintuplets are distorted so that the first two quintuplets together occupy only one-third of a beat. This interpretation strikes me as less viable than any of the other options proposed: to alter the rhythm of the quintuplets beginning at measure 19 seems bizarre, and to distort it in this way from the beginning of the piece stranger still. If anything, most performers tend to lengthen the first notes of each quintuplet group, not to shorten them. Earlier versions of this paper were presented at the Indiana University Graduate Theory Association Symposium (2008), the Society for Music Theory conference (Nashville, 2008), and colloquia at the University of Washington, the University of Iowa, and Florida State University. I am grateful for the many insightful comments received on those occasions, which have testified time and again to the extraordinary variety of perspectives and interpretations that sensitive musicians and listeners bring to the rhythmic phenomena discussed in this paper. Thanks also to Justin London for a thorough reading and several valuable suggestions, and to Ira Braus and Donald Byrd for some especially thought-provoking correspondence. No autograph of op. 21, no. 1 survives. Eusebius Mandyczewski, editor of the Breitkopf edition (1927), cites the Simrock edition as his primary source. A few other differences between the two editions are worth mentioning, though they bear less significantly, if at all, on the analysis here. In the Simrock, the left-hand triplets are beamed in groups of nine, spanning an entire measure, rather than in groups of three as in Breitkopf. (Nine-measure phrases with nine notes to the bar, as in the triplet voice in this variation, are an extraordinarily rare circumstance.) In some measures Simrock reverses the stem directions in the left hand, stemming the triplets upward and the duplets downward. In measure 5, Simrock gives the 32nd-note subtriplet to the triplet voice while in Breitkopf it belongs to the duplet voice. (This subtriplet imitates the grace notes of measure 3, though not in inversion.) After measure 11 Simrock abandons the left hand’s duplet beams entirely, but even after that point the third triplets nearly align with the right hand’s duplets. Finally, the Breitkopf score shows an incorrect placement of the first ending in the variation’s final system; this has been corrected in Example 1 to match Simrock. The present study is inevitably incomplete. In addition to rhythm/meter and performance practice there are many other angles from which the problem of impossible rhythms might be approached. Cognitive considerations are given short shrift here, as are historical precedents for the phenomenon. In some cases, a study of autographs and sketches might prove helpful in disentangling the roles of the composer and engraver. 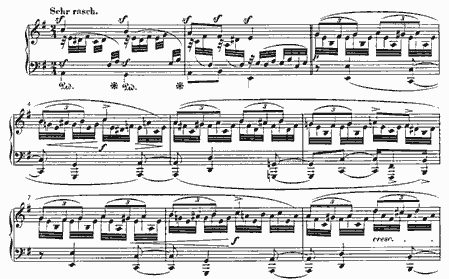 The passage in Example 11 is discussed by Krebs, who describes the “superposition of the cello’s duplet eighth notes on the piano’s triplets,” implying a triplet-priority reading on the part of the pianist but without noting that the duplet notation is also present in the piano (Krebs 1999, 210). Clarke 1987 shows that perception of rhythmic patterns is categorical: an ambiguous two-note pattern is typically heard either as a duplet or as a triplet, not as a member of some indeterminate middle category. Moreover, the boundary between the two categories shifts according to the musical context, perception of triplets becoming more likely in the presence of other triplets in the music. In the absence of other cues, Western-enculturated listeners are known to show a preference for binary metric groupings (Huron 2006, 195–96), so that a note placement that is mathematically closer to a triplet may nevertheless be perceived as a duplet. Paired impossibilities like those of Example 14 appear also in “Die Mainacht,” op. 43, no. 2; “An die Tauben,” op. 63, no. 4; “Wenn ich mit Menschen- und mit Engelzungen redete,” op. 121, no. 4; and the finale of the Cello Sonata in E Minor, op. 38. The duplet beams in Example 14 are absent from the first edition of this song (Simrock, 1873), but the impossible notations appear in the first editions of all of the other works just mentioned. Detailed performance studies show that pianists’ hands are rarely perfectly synchronized, nor is such synchronization necessarily considered desirable, even when (as is usually the case) the score contains no suggestion of asynchrony. See, for example, Palmer 1996, 441–42. Estimating the “just noticeable difference” (jnd) in the time domain—the smallest variation in timing that listeners are able to perceive—is a complex subject. London reports the results of studies showing that “the lower limit for meter, that is, the shortest interval that we can hear or perform as an element of a rhythmic figure, is about 100 milliseconds” (0.1 seconds)—approximately the length of the 32nd notes in Example 18—but that separate tones can be discerned, and variation in interonset intervals between two sounds can be discriminated, with much finer precision, heavily dependent on musical context London 2004, 27). Friberg and Sundberg 1995 show that in the context of a steady stream of pulses, the jnd is about 2.5 percent of the interonset interval between pulses, down to a minimum jnd of about 6 milliseconds (0.006 seconds). A listener hearing one performance at a time cannot directly judge an offset between attack points in two separate performances of an excerpt such as Example 18, but the variation in the lengths of triplets performed in a 3:2:3 ratio as in Example 19b, even at the rapid tempo of this example, is significant enough to be perceived with little difficulty. Ira Braus, in personal communication, has expressed a preference for still another performance strategy in measure 19: he suggests playing the right hand in even 32nd notes and the left in even triplets, so that the melodic doubling is not precisely synchronized. There are, to be sure, some circumstances in which by the composer’s design a beat is not a microscopic pinpoint at all, but is dispersed over a period of time. These situations, which include rolled chords, some grace notes, and unsynchronized attacks such as those in Example 17 above, have been studied in detail by Brent Yorgason (Yorgason 2009), but are generally distinct from the examples considered in this article. Example 22 is discussed in Byrd 1984, 57–58. Byrd’s dissertation, one of the few sources to mention explicitly the impossible nature of some rhythmic notations, confronts the problem for its implications on the design of music-notation software, which tends to resist attempts by users to do impossible things. The Stichvorlage autograph of the Preludes is in the National Library in Warsaw. The E-major Prelude autograph is reproduced in full in the front matter to the 1949 Paderewski edition of the Preludes. See Montgomery 1993 for an extensive bibliography on the subject of triplet assimilation, and Neumann 1987 in particular for examples in Bach and implications for earlier music. Montgomery 1993 was written in direct response to Badura-Skoda 1992, and prompted a counter-response from Malcolm Bilson (Bilson 1994). The Winterreise excerpts in Examples 24 and 26 appear in Brown 1999, 617, and Montgomery 1993, 90, respectively, and other examples similar to these are discussed in both sources. Errors of alignment are not uncommon in published scores, even when the note values are not in question. Undoubtedly many such errors are introduced during the engraving process. They may cause a performer momentary distraction even when the rhythms are simple, and can be seriously confusing in more complex situations. Several examples of the latter occur in the Schirmer editions of the piano works of Samuel Barber, for instance in the third of the Four Excursions, op. 20, measures 17 and 55, and the first movement of the Sonata, op. 26, measure 16. I am grateful to Michael Cuthbert for calling the Petrushka example to my attention. Chopin’s C-major Prelude, op. 28, no. 1, features five-note groupings also; this similarity is one of many ways in which the twenty-four Preludes of Scriabin’s op. 11 pay homage to Chopin’s op. 28. Astute readers may note a fourth premise lurking in this discussion, namely the supposition that the five quintuplets in each group are equal. An alternative reading to those considered here is theoretically possible, in which conditions X, Y, and Z are all satisfied but the quintuplets are distorted so that the first two quintuplets together occupy only one-third of a beat. This interpretation strikes me as less viable than any of the other options proposed: to alter the rhythm of the quintuplets beginning at measure 19 seems bizarre, and to distort it in this way from the beginning of the piece stranger still. If anything, most performers tend to lengthen the first notes of each quintuplet group, not to shorten them.